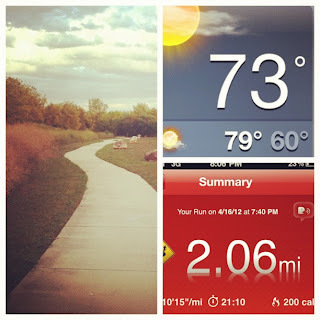 So this is my official second week of running and I have to tell you. I am loving it. Last Saturday I was supposed to up my 1 mile to 1.5 miles and I got into a good rhythm and ended up doing 1.75. I jumped from not thinking I could ever go past 1 mile to doing 1.75 easily, in the matter of one day. So what changed? Honestly, I think I figured out a couple of things I was doing "wrong" in the beginning. First, my breathing. I thought I was supposed to focus on breathing in through my nose and out through my mouth, which sounds right, but it's not. Instead, breathing in through both your mouth and nose at the same time, brings in more oxygen to your body, and your body needs the oxygen to keep going. I found a good rhythm of about 3 breaths in and 3 breaths out, to every 3 steps. Does that make sense? If your just starting out and having a hard time breathing, try this out. It will make a big difference. Second, I found my comfortable pace. Instead of trying to full out "run," I concentrate on an even pace that I can keep up for a while. My sister told me that if I wanted to start going farther, I needed to just find a good pace, even if it's slow, and work on my speed later. For some reason this was super freeing to me. 2 11 minute mile was my goal and if I got in under that then great, but it's not the focus. On Monday I started my 2 mile runs with this in mind. I started out where I felt good, and stayed there. No hurry, just a pace I could handle and feel good at. I ended up doing my first 2 miles, in about 20:30, with an average of 10:15 per mile. I have done my 2 mile run 3 times this week and this is right at about the pace I seem to be comfortable at. So, that right there is something to learn. Don't think you have to do your mile in a certain time. Give yourself freedom to just run it at your comfortable pace. Do it in your own time. If you are just starting out, time does not matter. Focusing first on finding your pace, and being able to do a full 2 miles without stopping should be your goal this second week. And if you can't do a full 2 miles, do what you can. But push yourself. Ok the last thing that has made a HUGE difference in my running is the music. Last week I talked about struggling to find the right music to get me motivated. Well, Saturday, I put it on Jesus Culture pandora station and have not gone back. Honestly, for me, this is the type of music that drives me and inspires me and gets me going. I was trying all kinds of other music that just wasn't me, thinking I needed it to get my booty moving. When in reality, my spirit was craving some good worship music. It really does make a huge difference. This may not be for everyone, and that is totally ok. Find whatever gets you going and inspires you to push through, because that's what you need. At moments I want to stop and walk I just listen to the words of the song and use it as a sort of prayer time, reflection, and just a time I quiet my mind. It's all His. This revelation has made running a totally different experience. And that brings me to where I want to go with this. For me, all of this training and finishing the race goes deep. It's more that just wanting to finish a half marathon to say that I did. It's more than the time I finish it in, or the other people who run a long side me. It's much more than the weight I might lose, or the change in my body that I know will happen. It's about being healthy, and fit, and focused on something physically that is good for me. About putting time and effort into myself and this body that has worked extra hard over the last few years. Most of all, it's about learning to love that body. I caught the shadow of myself running, as the sun was going down tonight and I felt proud. It may sound so cheesy, it may sound way too deep for you, but I don't really care, it's true. I haven't always treated my body well, and I sure as heck haven't always loved it, but that's changing. I'm changing that. I have scars and hips and marks that show the babies I've carried, and it's time I become proud of those things. It may not be perfect, it may not be what I want it to be or what society says it should be, but to God it's beautiful. It's his masterpiece. I'm His masterpiece. You're His masterpiece. Who are we to criticize it? My prayer is that this journey would not just be about crossing a finish line, but it would be about finding myself in Him even more. So, the biggest thing I've learned this week, from running, is to find your self in it. Find your pace, find your passion for it, find the music that inspires and moves you, and find your reason for it. Find who and what you're running for, and then do it. This will all look different for every person, but once you know these things....You can't fail. Saturday I jump to 2.5 miles and then next Monday I go to 3 miles. I'd be lyin if I said I wasn't nervous about this, I feel like I'm just getting comfortable with 2 miles. But, last week I thought 2 miles was miraculous. So, I just gotta remember my motto....one mile at a time. Did you start running this week? How are you doing with it? I'd love to hear about where you are with it and if you are struggling with something in particular let us know, maybe we can help. And again, if you are an experienced runner, feel free to give us beginners your advice or tips! Tell us what keeps you running! Thanks for the inspiration, Yes we are His masterpiece. He sees beauty in our imperfections and really, perfection in what WE think are imperfections, God is so amazing. I love the way He loves me. Now I need to love me better too. Thanks again. thats awesome, my back problems dont allow me to run, but I walk daily! This was just what I needed to hear this morning as tomorrow I will run/walk my first 5K. My training wasn't what it should have been but none the less, I plan on doing my best and crossing the finish line. Excited and looking forward to pancakes upon completion. God bless you Laura and thank you! So glad you found a pandora station that inspired you I will have to try that one! I upped my miles from 3 miles to 4 this past Saturday and have been doing that everyday but wednesday and it has been going really well! I was really scared to move up that extra mile, because at the 1.5 mark I am ready to turn around and start on the "home bound half" of the run, but I had to truck through it and keep going, and I realized if I just kept at my pace I could do it, and felt really good about myself when I got done! My focus this next week is my time a little bit more, I am stuck at the 9.35 min miles doing 4 and I really want to take that down and be at 9.15 this next week, and hopefully get to 9 the week after! I can only hope! yes yes pick a pace that you can do for a long time! thats how I did the 1/2. I always finish with way faster times than I started. I just gradually got in a pace. Keep it up girl! Laura this was such a great post. I cringe at the thought of running. Bad knees, can't breathe right, side cramps. Just never been my thang. But finding my pace and the thought of worship music has never crossed my mind when running and this may be the motivation I needed. Love you, thanks for sharing. Oh and you are beautiful and loved what you shared you have found in HIM about yourself. His masterpiece, so very very true. Your blog is so inspiring...I starting running last Monday, I haven't ran since high school in 1999 :-/ My goal was to do 1 mile under 10 mins, well I ran it in 12mins so I really cant complain...lol ;) I feel great, and now I am addicted b/c running is a great way to clean your mind :) Thanks so much Laura!!! This is awesome! I would like to start running but whenever I do, I do it like twice then don't run again for another few months. It's something I would love to enjoy but I find it so difficult to get past the first bit of getting used to it. As I was running this past week, I was just about to fall over dead ;) then I stared to think about your post last week and how you focus on your breathing. So I started to focus on my breathing and guess what IT WORKED! So thank you. Although, apparently I was doing it wrong also, so thanks for clarifying. And thanks especially for the inspiration!